Welcome on our online safaribaliticket.com and welcome on Bali night safari program, also one of the most favorite program ever. Different with Jungle Hopper package, for those who plan to join this Safari Bali night must book in advance as the slot of the program are very limited. 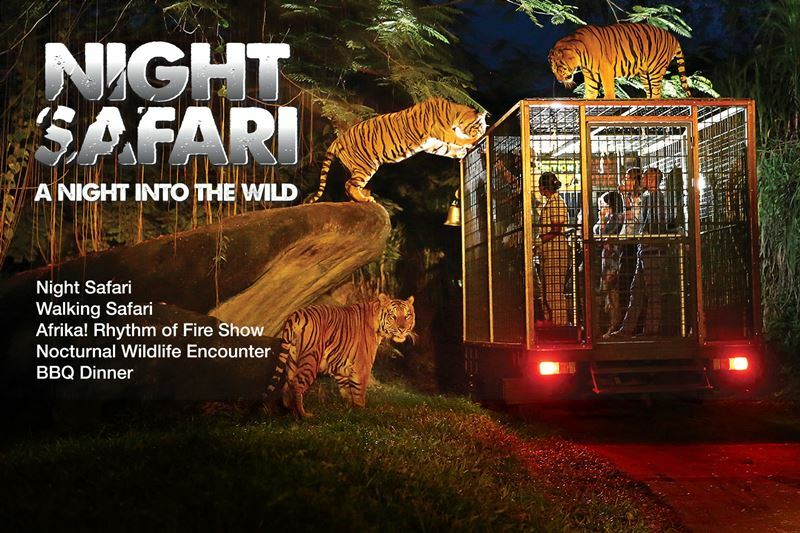 The concept of Night Safari at Bali Safari & Marine Park is to provide visitors with a thrilling experience similar to being out in the wilderness at night. We offers the ticket with or without hotel transfer. If you have driver and stay around Kuta, may start from your hotel around 16.00 and direct headed to Bali Safari, estimated around 17.30 will be reached here. Once your arrival please proceed grab the ticket at our counter and wait our lounge while having welcome drinks. While more group coming, we may take photo with the animal that we have here, surely you will assisted by our friendly staff. The Night safari is start around 18.15 where the group will be divided into a small group on each journey we have 15-20 person. The tram is designed with special cage and the visitors will stand up along the trip… our guide will explain about the animal details on each stop and also we will get carrot for feeding the bull, elephant, zebra and see other night collection safari journey. And the wilder trip when we on lions and tiger spot, where the tiger will jump up on our tram and the guide will feed them with meat and here is the highlight of the journey. The bus back to Nuchiro restaurant where we will have buffet dinner with abundance of food. If you want order extra drinks like beer, soft drink, juice with extra personal charge. The end we will entertain by Afrika rhythm of fire show for about 15 minutes, once the show is done, visitors also can take photo with the dancer for nice memory bring home. End of Night Safari program and have a nice holiday.